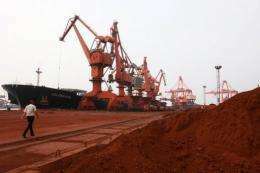 File photo shows soil containing various rare earths on a dock at the port in Lianyungang, east China's Jiangsu province. China has started stockpiling rare earths for strategic reserves, a state-backed newspaper said Thursday, in a move which may raise more worries over Beijing's control of the coveted resources. China has started stockpiling rare earths for strategic reserves, a state-backed newspaper said Thursday, in a move that may raise more worries over Beijing's control of the coveted resources. China has already started the purchase -- using state funds -- and storage of rare earths for strategic reserves, the China Securities Journal said, but did not specify exactly when the initiative was launched. "This is China's start of work for state strategic buying and storage of rare earths," the newspaper said. The country produces more than 90 percent of the world's rare earths, which are used in high-tech equipment ranging from iPods to missiles, and it has set production caps and export quotas on them. Major trading partners last month asked the World Trade Organization (WTO) to form a panel to resolve a dispute over China's export limits on rare earths after earlier consultations through the global trade body failed. The European Union, the United States and Japan accuse China of unfairly choking off exports of the commodities to benefit domestic industries. 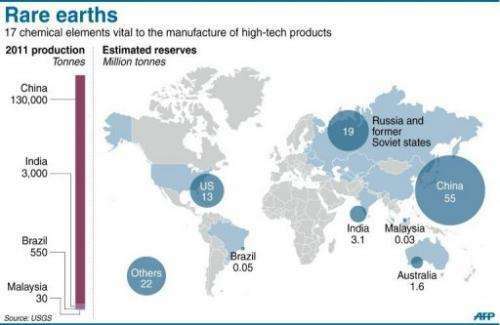 Graphic factfile on reserves and production of rare earth minerals worldwide. China has started stockpiling rare earths for strategic reserves, a state-backed newspaper said, in a move that may raise more worries over Beijing's control of the coveted resources. China has previously defended its rare earths policies, saying they aim to protect resources and the environment as part of an effort to promote sustainable development. A Chinese official said last month the regulation of the rare earths industry was in line with global trade rules. China had already announced its intention to build a strategic reserve system, but had not publicly said that it had started stockpiling. The China Securities Journal said current low prices for rare earths had prompted the start of strategic buying and the reserves could be used to address future shortfalls of the resources. Chinese market players hope the strategic buying will help stabilise prices, which plunged in the first half of this year after companies sold stocks ahead of planned tax changes, the newspaper said. The Ministry of Industry and Information Technology, which oversees the industry, declined to immediately comment on the report. A Shanghai-based metals analyst, who declined to be named, also told AFP that China wanted to take advantage of low prices for rare earths to build the strategic reserves. "The other reason is that China hopes to control rare earth prices within a reasonable range, so as to encourage the long-term, healthy development of downstream industries," the analyst said. Government stockpiling could reduce the volume of China's exports of rare earths, the analyst said. China has so far granted companies the right to export 21,226 tonnes of rare earths this year. In 2011, the government granted rare earth export quotas of 30,200 tonnes but only 18,600 tonnes were exported. Lets see... if the US does that (e.g. oil reserves) then it's just smart business. But if the Chinese do about the same thing it's inferred to be bad. Hypocrisy is in full bloom... again! As I read the article, I was thinking "Why is there a negative connotation to this article?" I'm glad they are stockpiling a rare resource. And why wouldn't they? How many problems would be caused by them running out? No more TV's, Cell Phones, Tablets, Computers, Lithium Ion Batteries, etc. Wouldnt we prefer that they manage this resource, increase costs slightly, and keep us from running out? Duh! America needs to get off its high horse and realize that other countries can have power too! The rare metals in China belongs to China and nobody else. In not so distant past these countries embargoed the China for expert of computer technologies, etc. The China wasn't even allowed to participate at cosmic research (ISS station) - so it constructed its own one. So why the western countries are so surprised with this approach? The problem is somewhere else: the so-called "green technologies" are mostly based on replacement of oil with rare materials. But in reality these technologies just drain the rare resources, contribute to environmental crisis and they're not sustainable anyway. So far these raw sources were cheap, because of neocolonial approach to the socialistic China - but the times changed and now the Western word is forced to find a solution of it. I'm glad they are stockpiling a rare resource. And why wouldn't they? There's already a number of promising alternatives for replacing them in electric motors being published. The real cost of shutting down or preventing domestic rare earth mines will have to be paid now.